We have become a elite Waterbox dealer. We are setting up a 130 display and will be stocking most sizes. 4 gallon to 230 gallon tanks will be at the shop ready to pick up hopefully in a few days. If anyone is after a certain size let us know We are still very big fans of Red Sea but we are excited to offer our customer different options. Picked up a new puppy yesterday, she’s a fox red lab, 8 weeks old. Oh Wow! the meeting at Mr.Bret's shop was Great, we all had a wonderful time out in Hillsboro that's for sure. Why don't you let me tell you about it. As you know, Paradise Corals was very gracious and opened their store front doors for the PNWMAS March club meeting, setting aside a couple group buys for the club and a putting together an attractive spread of coral deals. First thing walking in you just have to notice the clean cut reef aquariums, the open floors, and the attractive art decor. The shop has evolved since i had last been in and is looking sharp. Some of the tanks had some rather creative aquascaping going on along with some very colorful and vibrant animals within. I normally don't like black sand, but this tank was sporting it pretty well, making that Huge Helio Fungia just pop! After taking in some of the stores decor and aqua life I got right into greeting some familiar faces that started to arrive. HigherThinking and Vance talking tank. I wish I had more time to swing by your pad, I didn't know you lived relatively close to here and I don't get this way very often. Now that I know there are friends out that way I might just make a trip out of it sometime just to visit. NateDawg rolling up on some nice "Designer" Zoanthids. You got some good taste in corals but some of those are too rich for my blood man. Did you find your Stratocaster? TrailerMan got to get a refreshing talk on camera work and is now hopefully giving aquarium photography another go. A little know how and a lot of practice can make all the difference in the world. Gumby with his eagle eyes has spotted another exceptional piece. I know he walked away with a nice chunk of that steaming Unicorn Poop. And that tank tour you were talking about sounded intriguing, it has been a while since we have had one of those. Jeremevans, our club treasurer, talking with Higherthinking about tanks. Apparently HigherThinking is working on a new 360 gallon build. 8 foot by 3 foot is going to be one swell of a centerpiece my friend. BicycleBill giving some solid advice to a fellow reefer in the store. A seasoned veteran that knows a few tips and tricks of the trade. Last time I saw his tank it was so full of coral colonies I am not sure how he could add any more to the system. SuncrestReef came with not only his camera gear, but his laptop which contained the programs he used for his photography work. He had several amazing shots from around the store and I was hoping that maybe he will be so kind as to post up a few of those up on the forum at some point. In fact I would love to see some of the pictures people were able to get after a few of those pointers we got from the talk. Here we have the host Mr.Bret in his natural habitat, creeping amongst the corals. Actually, this was one of the nice raffle prizes presented by Paradise Corals and the PNWMAS club....And speaking of raffles. When it came time for drawing the winning tickets our outstanding Board Of Directors member AlbertaReef got things underway, with the assistance of Mrs.Bret to make things kosher. On the far right ZorroReef is hoping for his shot at the Paradise Corals Zoanthid Frag Pack...Me too buddy, me too. W-T-F snagging the 1K Gyre circulation pump. Sounds like you have a spot for it in a new frag tank? Would have loved to stop by to see your aquarium like I had wanted to but I had to make the trip back to Corvallis earlier than expected due to babysitter/children complications. I will make sure to keep in touch for the next time I head North and see if we can touch bases again. Terik hit it big when he got his ticket pulled to win the MP10 Quite Drive pump. I am sure you are going to love the different modes and flow power control. Definitely a new and improved model over the original releases. And Trailerman takes home the digital salinity and temperture gauge, one I had been wanting to test myself. You will have to let us know how well it holds up over time, I test salinity countless times in a week and often worry about accuracy. One of the additional perks to attending is that W-T-F was kind enough to share his extensive knowledge on photography in a talk focusing on getting quality reef tank pictures. I found his speech to be rather informative and at the same time straight forward, which I like. He even went through a step by step demonstration right there in the shop, and afterwards answered an onslaught of questions. Thank You Very much Damien, the club and I thoroughly enjoyed it. I have some video but without a tripod and proper microphone it was poorly shot, barely viable. But I definitely got a few pointers to now make my future movie captures in better quality. Here is a small recap of some things he had to say. W-T-F started the presentation with some personal background on his previous occupations as a photographer as well as his popular YouTube channel about reef related subjects. Like many of us he enjoys the various hobbies found within the reefing hobby. 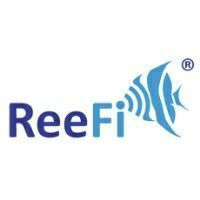 He instantly grabbed our attention with this great analogy that us reefers would understand. Where having a successful reef aquarium is the art of maintaining water, photography is essentially the art of maintaining light. Here he talked about the "Gear", and had a list of what he felt were subjects needing further attention. Top of the list was your lens matters the most, with some explanations of macro and zoom vs prime. Next on this list was information about megapixel count, post editing, and cell phones being good assets with the recent technology that has improved their cameras quality. Having a larger pixel count, and shooting in RAW picture format allows for a lot more wiggle room when it comes to cropping and post editing a photo. Talk about a pretty comprehensive list of things to go through to get that clean clear shot. I am sometimes in such a hurry to get a pic that I forget that there can be some very helpful adjustments that I can make when I am in my own tanks at home for much better results. And here patience is a very good thing. In this shot he is walking everybody through a real time photo shoot on some corals in the shop, then telling us the relation of the ISO and F stop. It was really nice watching someone else do the camera work in real life while seeing it blown up on the big screen at the same time. The end was a short walk through of some of the post editing software he likes to use and ways to make a photo to more closely resemble what our eyes have captured. Then is was onto many a questions, which I must say thank you again for answering. SuncrestReef on the right getting a head start on setup and execution, these two are much better camera men than I. I see quite a few members watching the talk on this side, Mrs.Bret,Kevin, ZorroReef, Gumby, Vance, Albertareef, and Kireek hiding off to the right. Clockwise in this frame we have NateDawg, Brian, and JTarmitage lending their ear to the speech. I didn't catch the name of the gentleman in the striped shirt though. Again screen names from left to right, Trailerman, Suellen?, SuncrestReef, And HigherThinking. This particular talk drew a number of people in and kept their attention there. Apparently there are a number of folks like me who wouldn't mind brushing up on their camera skills. Since it was a reef shop, and a photography talk, I figured a few gratuitous photos would not be too much to add into the mix.... Who doesn't like to see a Top Down shot? The store's collection was looking very nice and healthy. Taking home a few things today that's for sure. There were a few of the mini jellyfish aquariums on display showing off the color changing display and the delicate creatures within. Maybe I should have waited for W-T-F's talk before I took some of my photos and then I might have had a better representation of these little guys. They can be somewhat mesmerizing. As usual, the store had some amazing realistic paintings that really stood out. I am thinking I need to make sure I have a few extra dollars next time I come out this way so I can walk home with a nice piece of art as well. They cost as much as a couple frags really, and you don't have to find sponges to feed these nudibranchs. The corals probably still need good light to look their best though. Well folks, you know my usual wrap up here at the end of the meeting threads. I apologize if I didn't get your picture in here, even though I take a number of photos I can be in the wrong place at the wrong time as often as I am in the right one. If you all have some pictures to add of the things I missed that would be Great. And now a Big Thank you to MrBret, Mrs.Bret, and the Paradise Coral crew! You had a crisp and clean store, wonderful foods, great service and corals, and were excellent hosts. We loved the group buys too. Thank You W-T-F for coming out and being so generous with your time and knowledge, we really appreciate it. I took away quite a bit to help me hone my beginner photography skills. Thank You to the Officers and Board Of Directors that work behind the scenes making efforts to be of service to the club, bringing everything together. And last but not least I would like to thank the people of the club itself, to whom without, there would be no PNWMAS, Thank you all. REEF ON!!! Sorry, just had to end the thread with a shot of Mr.Bret's custom frag tank stand's angry octopus. Haven't seen that in action since the Frag Expo a while back. Very Cool indeed. Good timing on the thread! I just found out that my blue Merle corgi was born just 2 days ago and will be getting her in May!! We are having a party!!! Save the date you won’t want to miss this !! Sirena and I miss you all and we miss throwing a good party !! When: Sunday May 5 12 noon Where: Cuttle Fish and Corals What : Street tacos and all sorts of Mexican fare provided by our own skilled chefs Sirena and Scott There will be group buys , there will be raffles , there will be deals!! Holly will be there with ten dollar frags! More to come!!! Hey reefers I've been out of the hobby for over 15 years and now back in. It's one of those hobbies that's always been in the forefront but I've had to sacrifice a lot of time and energy in the last do many years raising kids and now grandkids. Anyways glad to be back in the hobby. Scored a great deal on my 60 gal. Cube with stand and rodi 5 stage filter plus heater, power heads and other equipment from a local reefer in pdx. Got a somatic 60 sump and the somatic 60 skimmer which is a great match for this setup. First nice score was from cuttlefish in the form of a mated pair of true perc clowns that I just love! Most beautiful pair of clowns I've ever seen. Well folks, the club has been looking into some upcoming meetings and do we have some great news for You! Coming up in the roster for the month of April is another one of our amazing sponsors, Salem Oregon's The Premium Aquarium!!! When - Sunday April 28th 1:00 PM - 3:00 PM Where - 1875 25th St SE, Salem, OR 97302 What - A friendly gathering for us salt water reefer including food, raffles, and great deals on some nice TPA livestock. Now we hope your ready to Party, because Garret always throws a fantastic shindig at his fine establishment. We are also finalizing a guest speaker to add to the merriments, but I am going to keep that as a bit of a mystery for now. I also hear that the PNWMAS club and Garret at The Premium Aquarium are going to be bringing you a stellar line up of raffle prizes to peak your interests. And don't forget the ever changing smorgasbord of beautiful corals and fish the shop has to offer. I know I say this much too often but, this is going to be a good one for sure! So, as usual, stay tuned for more updates on the upcoming event. Couple shots of my Red Sea Reefer 450. AI Hydra 26HD on full spectrum. Here's our new puppy. 90lbs. Yes, he's still a puppy. Rescued a few weeks ago from horrible owners, he's been through a few homes. Is a handful as he's had no training it seems. Our half acre is not enough for him. Enjoying some sunshine yesterday out in the garden. Attempting to enter the wide smile contest. I've been keeping a spreadsheet of every coral I purchase. It's interesting to see how many came from @CuttleFishandCoral: And a shout out to @Gil&Fin for being the runner up! Mouse Breed Frenchie almost 2yrs old As scott calls mouse Spaz. Edward/Bubs Breed Frug 3yrs old. Thanks to @CuttleFishandCoral for gifting the Boys & Girls Club some new fish! They had trouble getting the feeding right and lost their previous two, so the goal this time was to make sure we added enough fish to use the auto feeder. 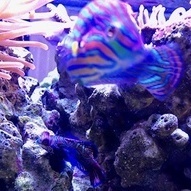 From Jeff, we added a McCosker’s wrasse and an aurora goby, and purchased from Seahorse were a long-nosed hawkfish and red firefish. The kids voted on these fish from a list of choices that would work well together and be easy to care for; it’s funny noticing all four choices are red. They have a few more selections to be added soon, but it’s always best to get the more peaceful specimens in first. Safety Stop dip has been working well! McCosker’s at the top left, just seconds after being added to the tank. Bottom center/left, you can see the wrasse on his way into hiding, as well as the aurora goby. Aptasia getting a nudge from Jim’s kalkwasser syringe. Adding peppermint shrimp to the list of tank needs! Overall, coming along nicely! Photo taken during maintenance, so forgive the low water level and slightly open cabinet doors. My best bud Recon, he will be 14 this year. Wow...I've hit the big time! Hello all, We are testing out a new strategy for the classifieds to see if it might help reduce some of the confusion and frustration we have had with the post count requirements. For now, there will be no minimum post requirements for using the classifieds but... all posts will require approval prior to going live. We hope this will reduce the temptation to either post in other forums or spam threads to boost post counts. It will also help ensure we aren’t spammed and that pricing is included in all ads. If you experience any problems please let us know and we will reassess as needed. Also, posters might consider adding some location information to their listings as that is often one of the first questions to come up. Either that or add yourself to the new members map so people can see where you are! Thank you all for your patience and participation. Hi guys! Things are really coming along in the classroom tank! Massive thanks to @Flashy Fins and @Gumby for coming out this weekend to help set up the RODI and bring us some super cool corals! The boys also chose some fish this week and I made a trip into the big city to get them- here is a pic of the crew: So far, so good, all the inhabitants seem to be getting along. The firefish is afraid of the current from the powerheads and only comes out when they are turned off, but the clowns have been very sociable. We also got a cleaner shrimp and peppermint shrimp, and the boys made quick work of naming everyone. They are super stoked about the tank, and will sit in front of it for great lengths of time "tank gazing" and arguing over who gets to feed the fish. As soon as I get more confident with the tank's maintenance, the real lessons will begin and the guys will learn about the tank ecosystem and take over its maintenance. So many thanks to all the club members who have supported Tanks for Teachers in one way or another, your generosity is inspiring the reefers of the future! My hubby is happy that I'm happy (happy wife, happy life, right?). I used to think he didn't pay attention to what's in my tank until one day I brought home a new coral and he said, "I like your new goniopora." WTH?! ❤️ Now, if we shared our money, it would be a different matter entirely. When I tell him I just bought a $500 fish he says, "That's great! Let me see it!" If we had a joint budget, well you can guess how that would go over. Works in reverse too though. When he wants to show me the new quad he just bought on Craigslist I say, "I'm so happy for you! Your other 4x4 quad doesn't have a winch. Plus the color matches your 700 Raptor and YFZ 450. It can probably fit behind your two Z400s, right next to the Honda 450X and 250X." See what I mean? Big thanks to Jeff at Cuttlefish & Corals! Got my white Hydra 26's up with Jeff's support! Night and day, these lights are incredible. It's only been a couple of days but all the coral has responded very positively. Good thing I bought a PAR meter along with them! I could be in love! This new arrival could be one of the coolest creatures I’ve ever seen. Kim will keep everyone updated for sure. We are working really hard on getting an amazing event planned. The raffle prizes are going to be huge as well. Every raffle ticket purchased will be going 100% to the Sexual Assault Resource Center(SARC). Along with a large percentage of sales that day. Josephine Sage She's almost 2 out hunting birds in Maupin. Your tank mates could talk?? Post a pic or 2 and and a caption....should be fun " I think he went That way------> "
Here's mine: Harley is 9 as of this February. 😞 We've had her since I was in the service and she's been the best of friends. She was born in Texas. I spotted one of my nudibranchs tonight for the first time since introducing them into my tank in February. It has really grown! It's at least 4x larger than when I got them, so obviously they've been eating well. I still have aiptasia, but I've noticed some of them magically disappearing overnight. Glad to know they're still alive! I've always heard that mushroom corals grow and reproduce quickly. However, I've had several mushrooms in my tank for over 8 months with none of them reproducing. Until now! Tonight I discovered a new baby St. Thomas mushroom: This probably isn't a big deal to the rest of you, but it's pretty exciting for me since it's a first in my tank. Like Suncrest said - if you isolated it quickly by turning off the return and can completely drain and replenish the sump that should be a good start and hopefully limit any damage. Probably would be good to run some carbon when you can get some in there and test your parameters just to be safe Not to make light of the situation but this may the most “Portland” post I have seen here for a long while - where else do you get dogs knocking IPA into reef tanks right? Good luck!